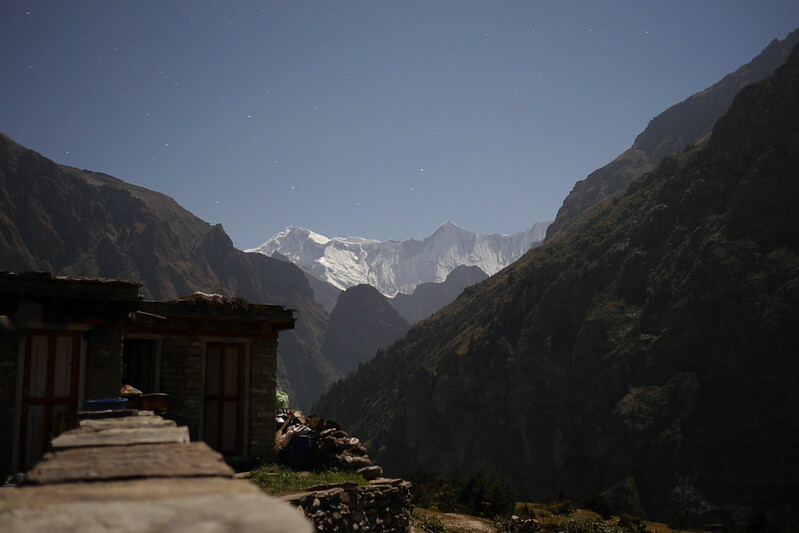 Well, it’s high time that I put fingers to the keyboard and started sharing with you all some of the stories from our epic trip of a lifetime to Nepal last fall. I wasn’t sure where to start, so to kick things off, I focused on getting the pictures posted on flickr. Luckily, that work is done, and you can see ALL the pictures in the collection. As you’ll see below, to make it as easy as possible, I managed to whittle down the ‘best of’ shots to just under 200! 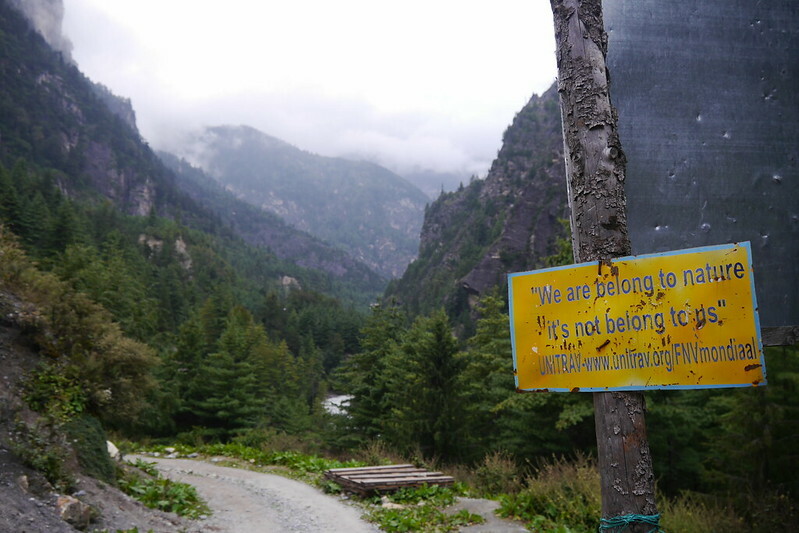 A tough feat in such a picturesque part of the world. You can scroll through them below, or better yet, watch the gorgeous full-screen slideshow (click the little “play” icon)! 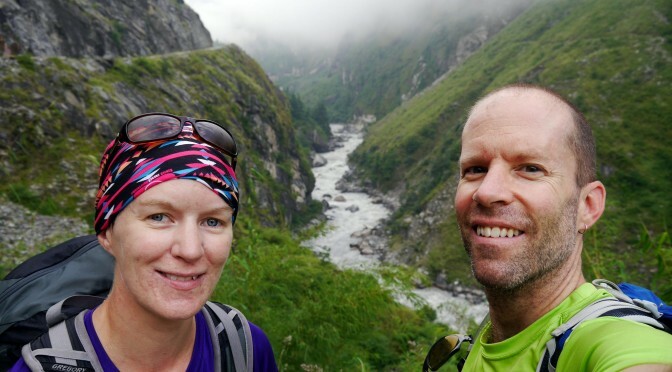 At any rate, this, my first post in the series, will focus on the relative hustle and bustle of the start and finish of our trekking, which found us in Kathmandu and Pokhara. Read on for the details! As many of you are aware, I have decided that the mountain goat is probably my spirit animal. I’m always most relaxed when surrounded by imposing peaks. 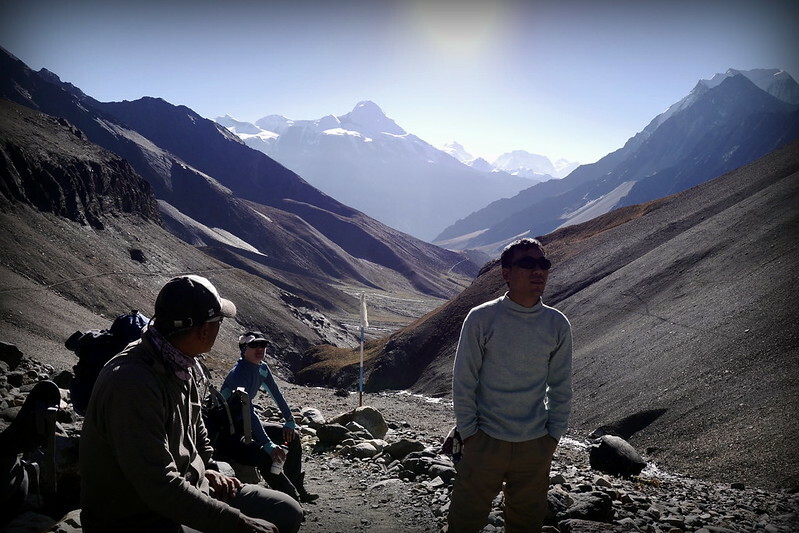 Some years ago, several people suggested I should make my way to the Annapurna Circuit in Nepal. 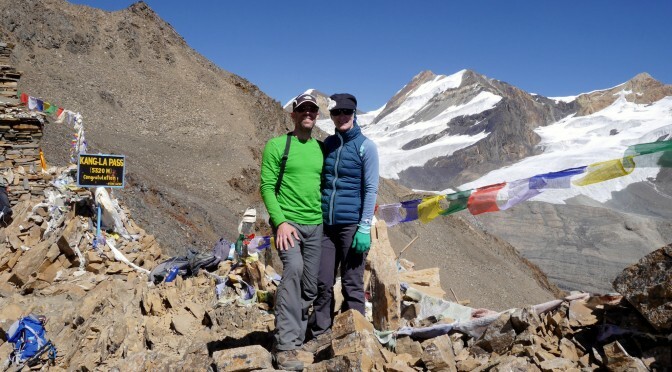 It’s taken a few years to act on the advice, but last fall, for our 2 year anniversary, Deanna and I decided to do just that, and spend the better part of a month in the high Himalaya, and experience the true culture and beauty of Nepal. 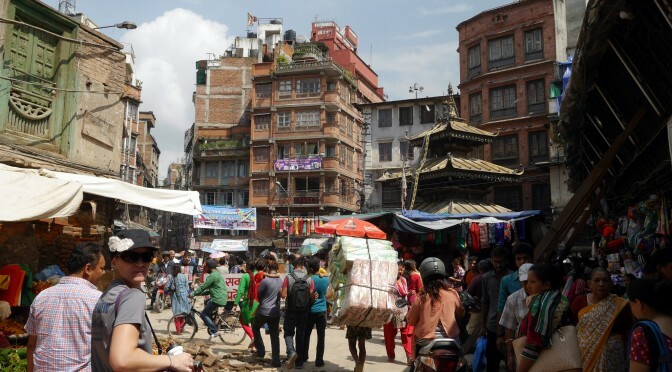 We booked a trip with a local tour operator based on recommendations, packed our bags, and made our way to the Nepali capital of Kathmandu. While cities the world over may seem substantially the same, any of you who have spent time in far flung corners will know that there are clear differences in all of them, from sights, smells, and sounds. 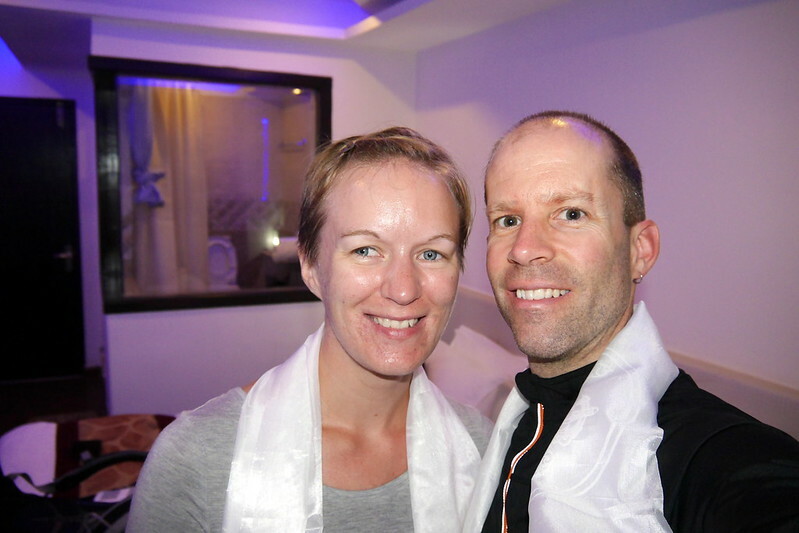 We arrived in the late evening after over 24 hours of transit, so after a full nights’ rest, we were ready to explore and see the very sprawling city of Kathmandu. Luckily, our guide arranged for a driver and for him to personally give us a tour of the city. With only about 24 hours to see the capital before driving off into the more remote regions, we had to be efficient. In our opening day, we managed to see major sites such as the Monkey Temple, the Garden of Dreams, and a traditional temple / monastery. More importantly, we did a lot of wandering through the market areas and just generally taking in the sights. We were particularly interested to see what sort of obvious damage was still visible from the earthquakes earlier in the year. We didn’t have to look far, as there were lots of clear signs of rubble, and of people still recovering. However, there was also a clear sense of perseverance all around us. 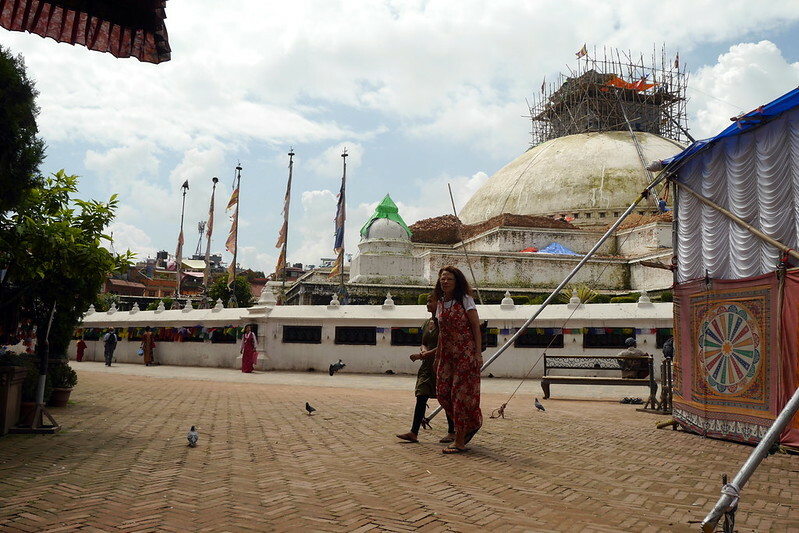 Probably the most unfortunate view was the destruction of the Boudhanath temple, which is one of the largest Stupas in Nepal, and a Unesco World Heritage Site. Of course, it is only one of many treasures that suffered great damage. In stark contrast to the hustle and bustle of the core of Kathmandu was a very special park that we visited, the ‘Garden of Dreams’. Although relatively small in size, this greenspace in the centre of the chaos is a great place to just relax for a little bit. 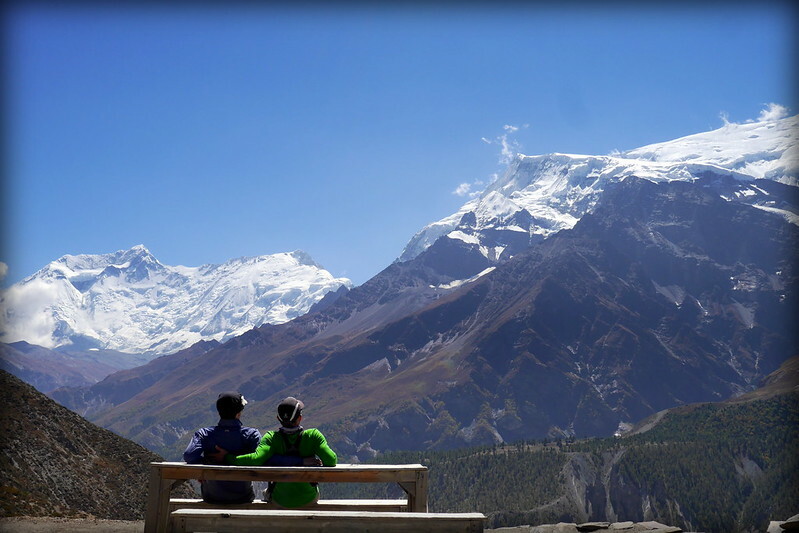 It has apparently also become a go-to destination for young Nepali folks to go for a ‘date’. Easy to see why. 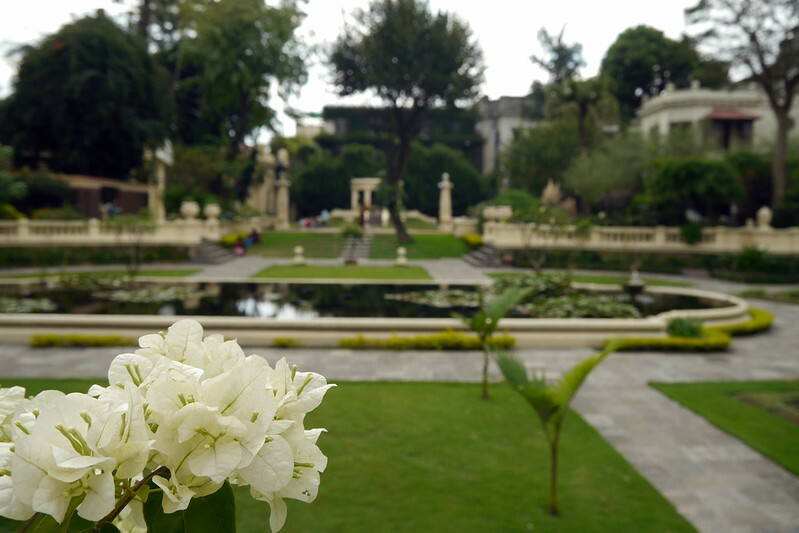 Although you pay a small admission fee, once inside, it’s easy to find some peace in the gardens. As a real treat for us though was the fact that at the end of the day, our guide (and company owner) actually invited us to his family’s home to share a meal with them. This was definitely something not to miss, as we got to see how the Nepali live in their own homes, and be treated to some great home cooking of a traditional Nepali dish, Dal Bhat. It’s a meal we’d have many many times over the course of the next few weeks! 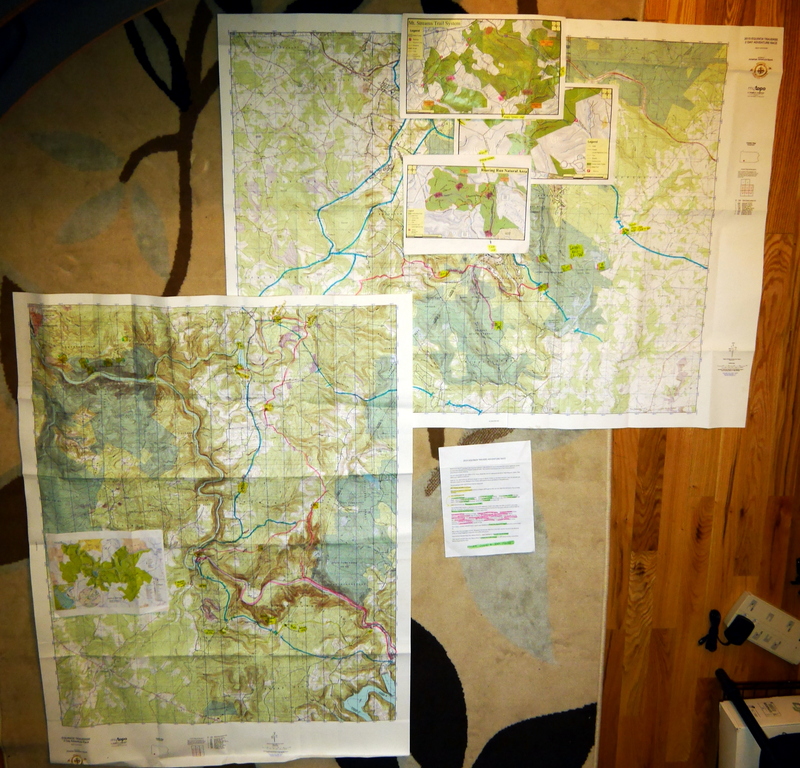 To cap off the night, we pored over the maps and itinerary for the upcoming trekking while sipping hot tea. All in all, a pretty amazing first day! 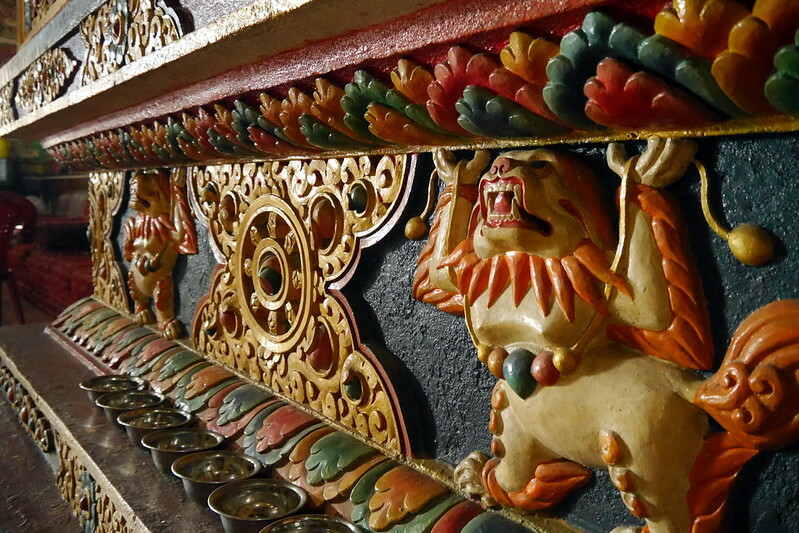 We did spend another day in Kathmandu, but not until the very end of our trip, and by then, our focus was on picking up a few souvenirs, enjoying the last couple meals there, and reflecting on our whole trip. 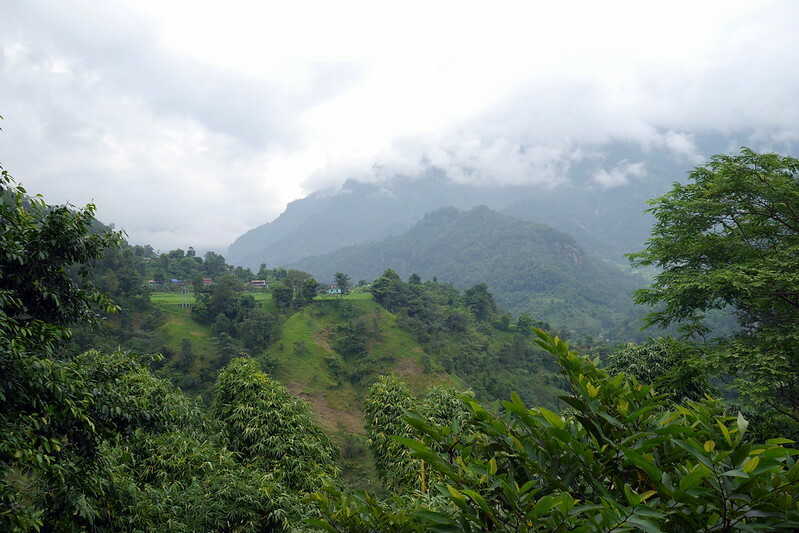 However, before that, we had spent a couple nights in the city of Pokhara, the largest city in the Annapurna region. 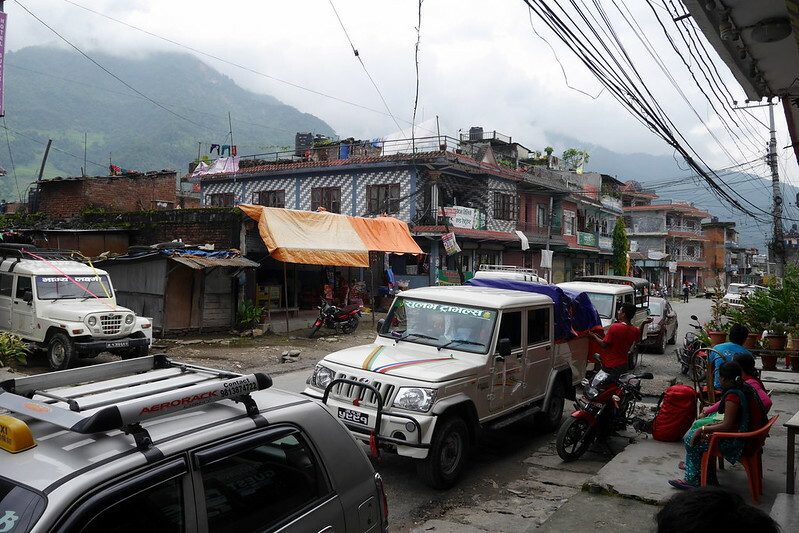 Whereas Kathmandu was very chaotic and noisy, imagine Pokhara being Ottawa and Kathmandu being Toronto. Still large, but much more laid back. 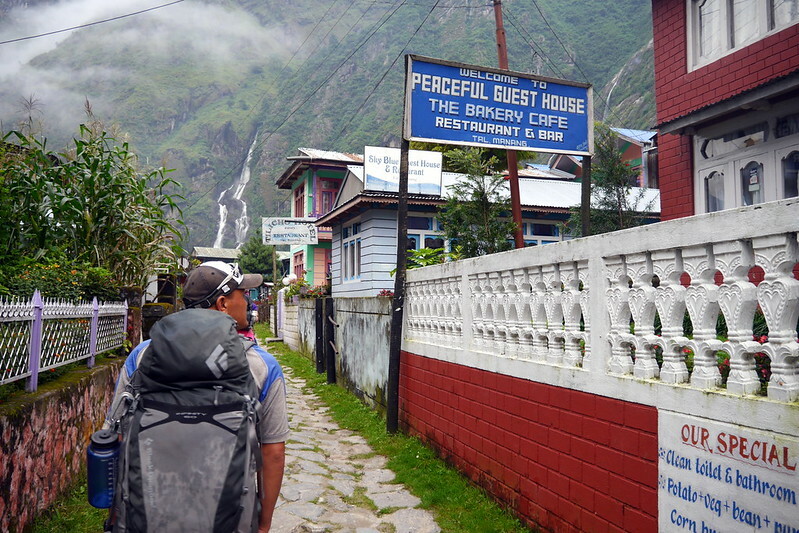 This is a true tourist town, with countless people in town either finishing off their trekking, or gearing up to head out. 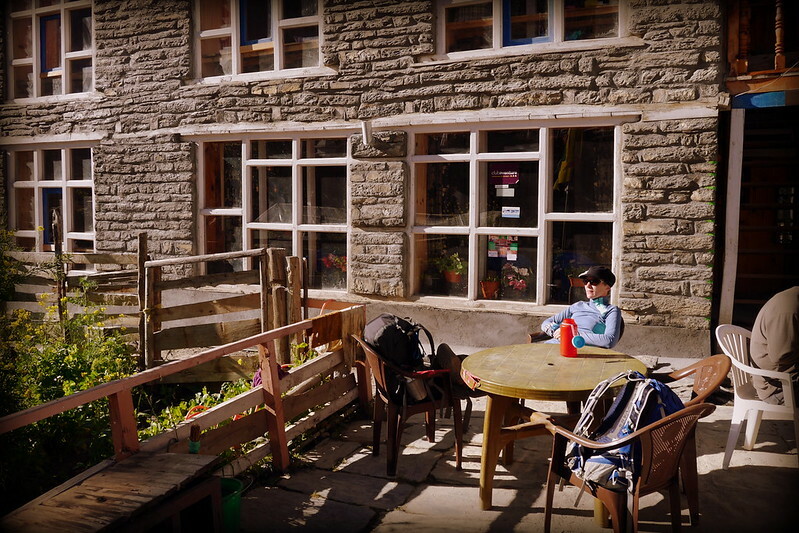 Since we were all done our trekking, this was our rest and recharging point. In fact, the first stop for me was to find a barber shop to have a hot shave, getting rid of my mountain man beard. 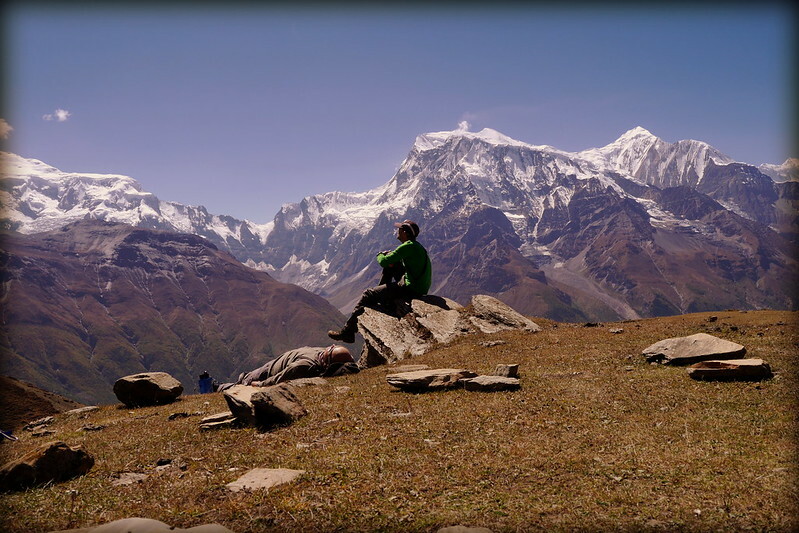 It’s worth noting a few things about Pokhara. 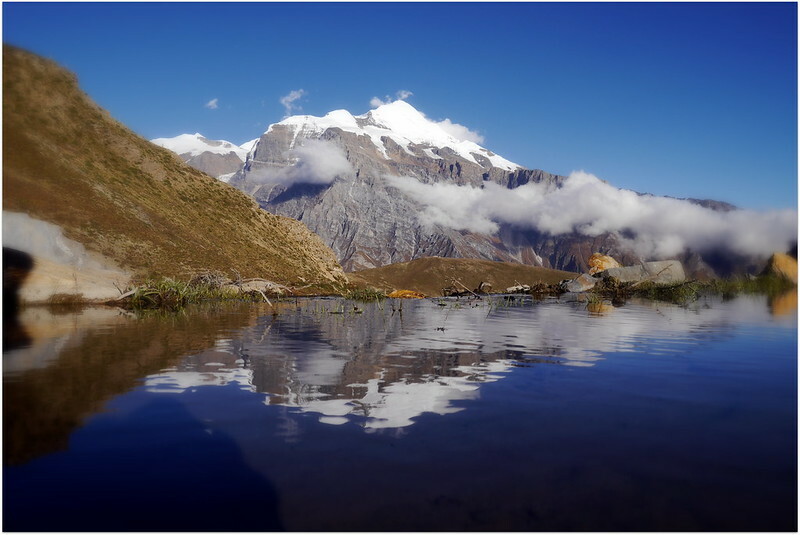 First, it is a lake-side town, so it great options for heading out on the water and admiring the peaks around you. Unfortunately for us, it was a bit overcast when we were there. Secondly, thanks to a national fuel shortage (compliments of a blockade by India), things were even quieter than usual in the core of the city, with only limited vehicle traffic. Of course, that actually meant a few headaches for us as well (e.g. 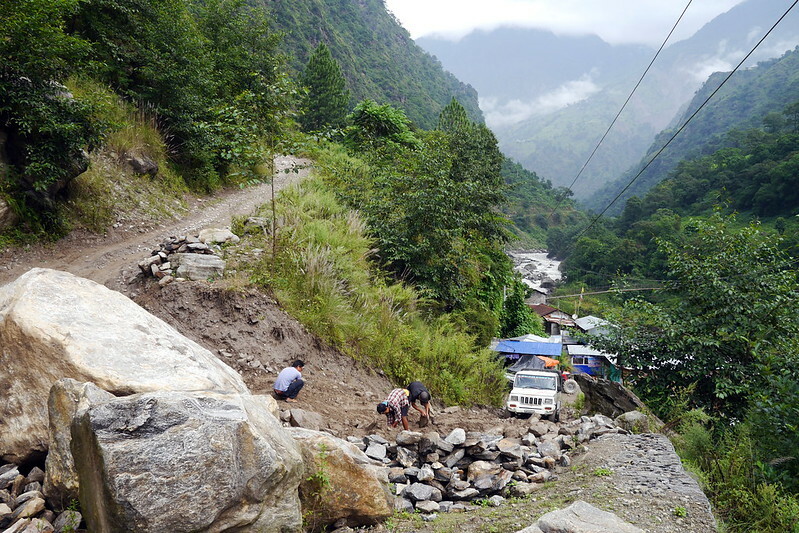 having to fly from there to Kathmandu due to lack of buses / cars). I think this is a town we could have easily spent an extra few days in. As it was, we spent most of our time on foot wandering around the waterfront area, thanks to a plethora of bars and eateries. 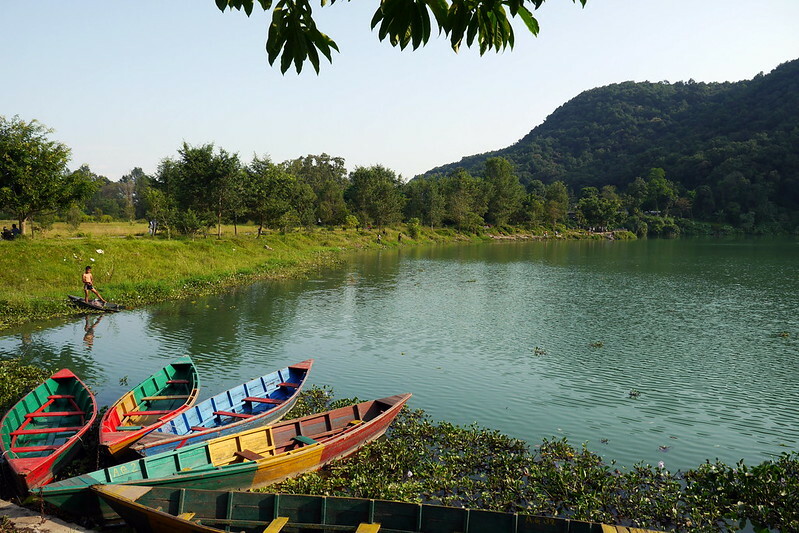 However, the stop wouldn’t be complete without a trip to a place called the World Peace Pagoda, an imposing structure high in the hills surrounding Pokhara. Getting there would have been a challenge, were it not for our sense of adventure. We ended up renting bicycles for half a day and making the trip on two wheels. 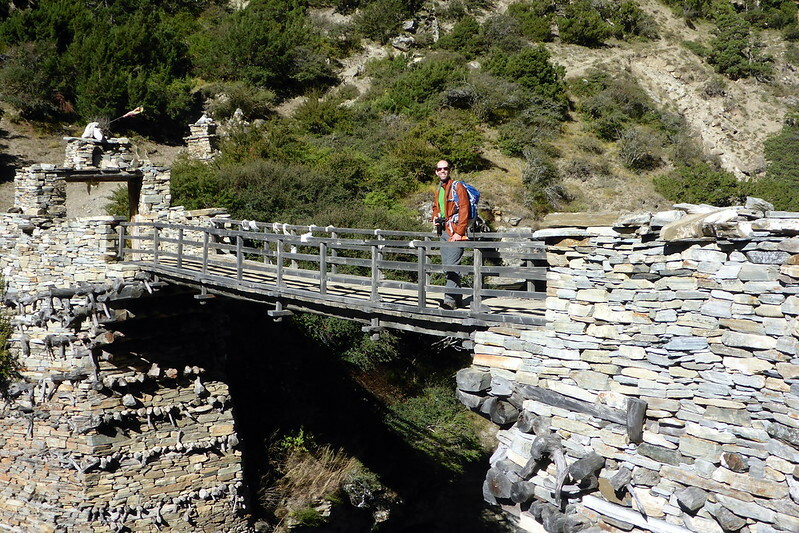 Unfortunately, we hadn’t counted on it being so HOT and hard a ride up the winding mountain road. 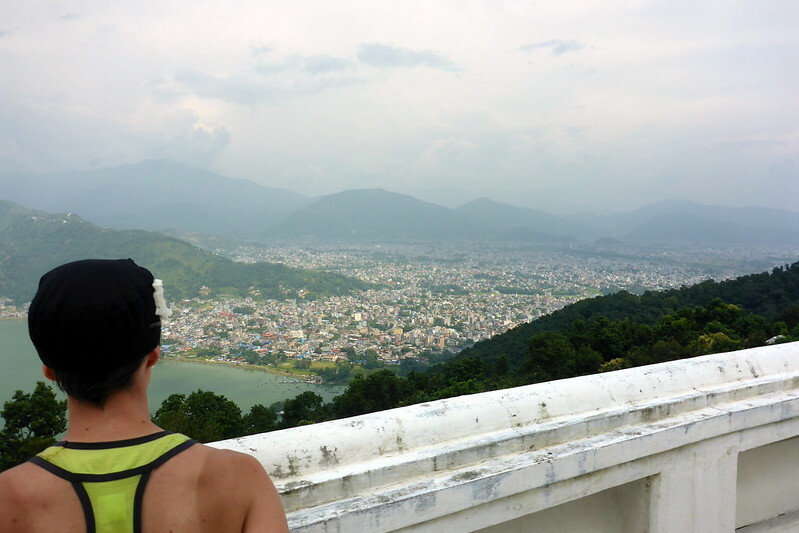 However, we were rewarded with great views of the Pagoda, as well as the entire city of Pokhara sprawling out beneath. 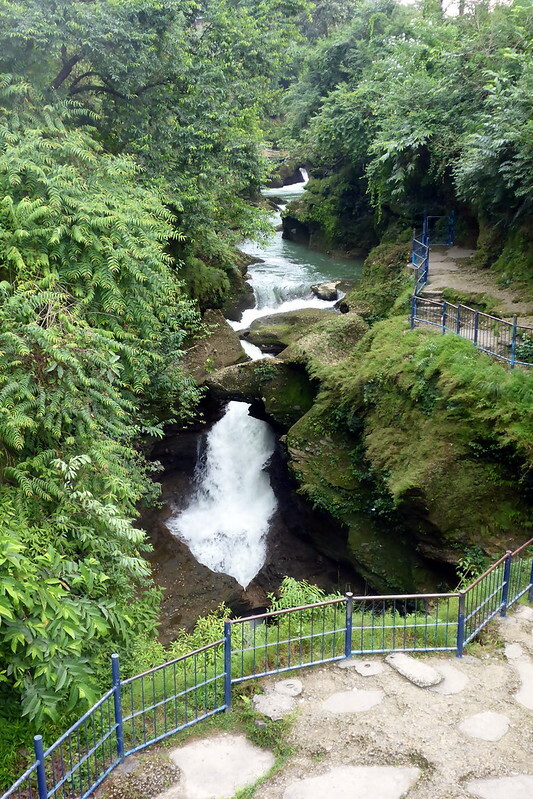 In addition, having the bikes gave us a chance to visit a few of the other more far flung sights such as Devi Falls. As always with a bike, it also allowed us to explore the whole region with no fixed schedule or expectations. We meandered around here and there on side streets, getting somewhat mixed up about where we were, but stumbling across plenty of cool opportunities to interact with local and see the back alleys. Good thing we felt safe out there. 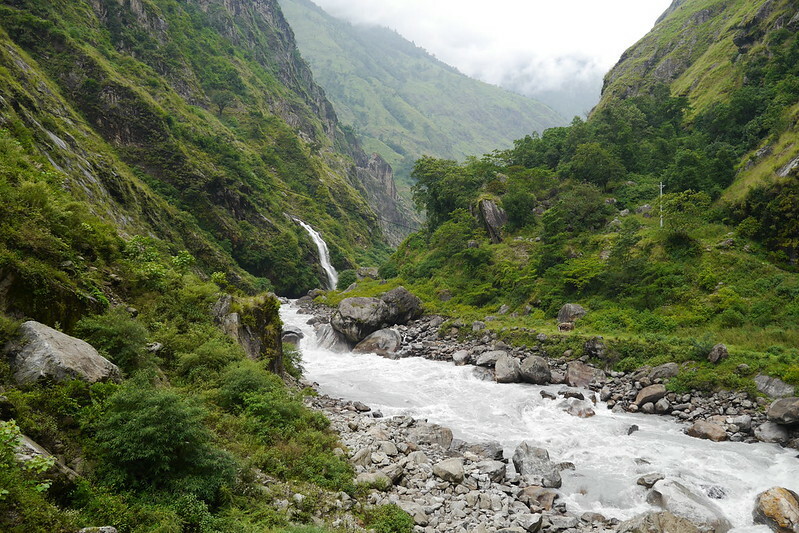 While I’m always the first to tell you all that I don’t like cities, these two Nepali destinations would be on a ‘must see’ to any trip to Nepal. Firstly, you can’t avoid (nor should you) Kathmandu on any flights to the country. 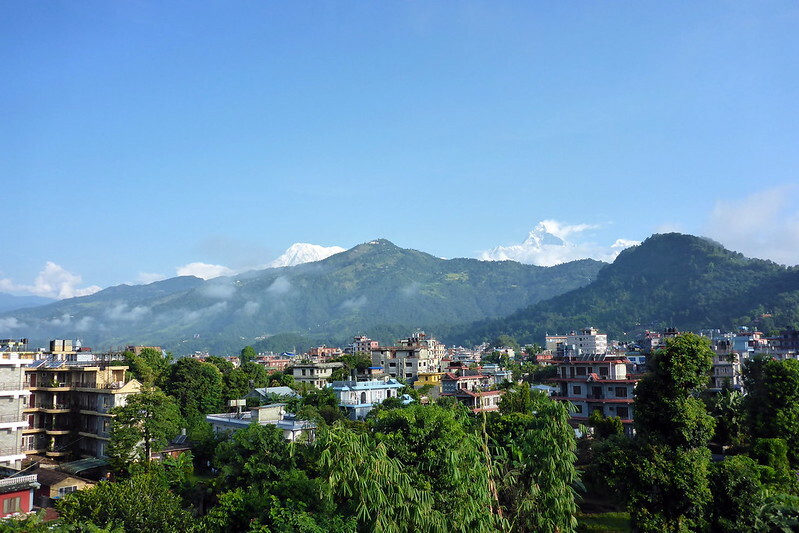 The entire Kathmandu valley is massive in size, with the population of this city of about 1 million sprawling out in an area of about 50 square kilometers. Pretty much all the buildings are below 5 stories, so you can imagine it spreading out. 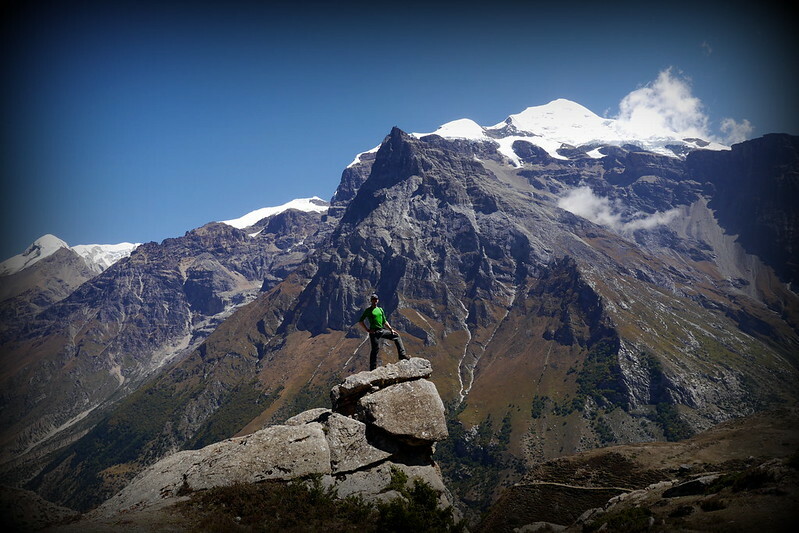 Secondly, Pokhara is truly the ideal ‘chilling out’ town of Nepal. There is enough of an ‘east meets west’ vibe here, that there are endless options for entertaining yourself and people watching. 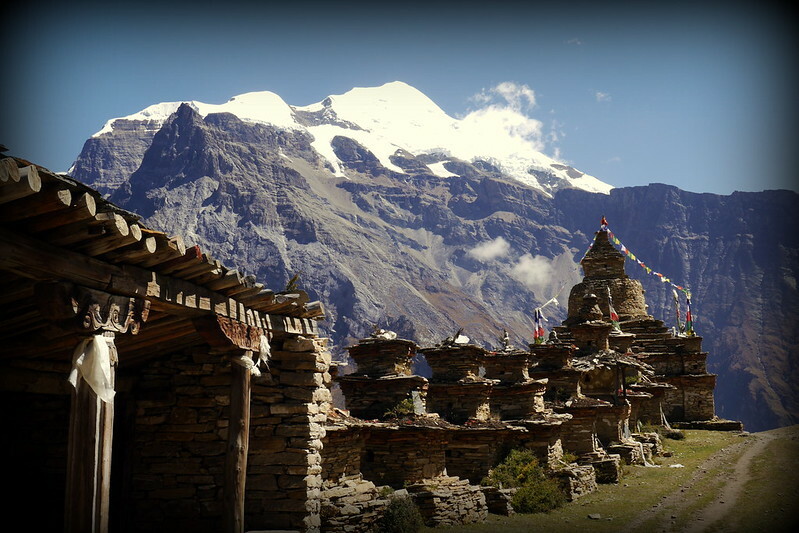 For those reasons, this seemed like a good way to start the chronicles from Nepal. 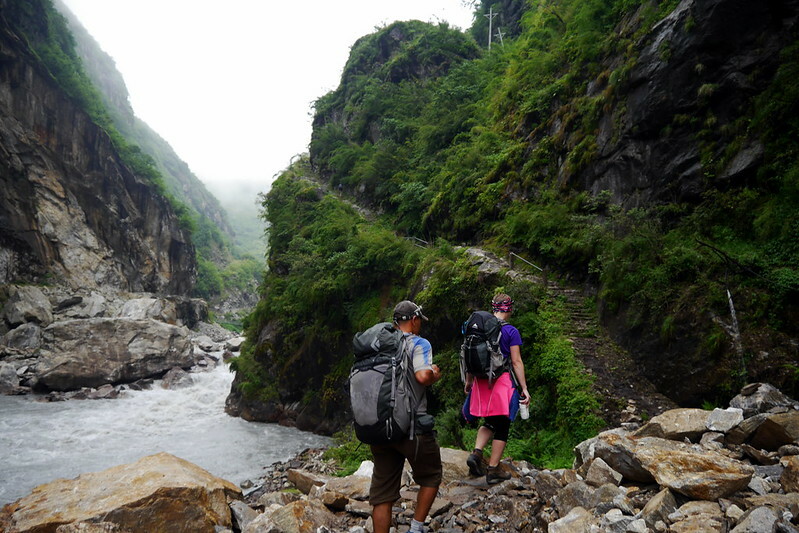 But much more exciting to me will be sharing the next major sections of the trip: the actual trekking! Stay tuned for those stories coming up. I truly am a big fan of alliteration. That, and palindromes. Although, I’ve always wondered why exactly the word palindrome itself isn’t a palindrome. But I digress. The point of this post is obviously to tell you all about my latest race, not of my grammatical proclivities :-). 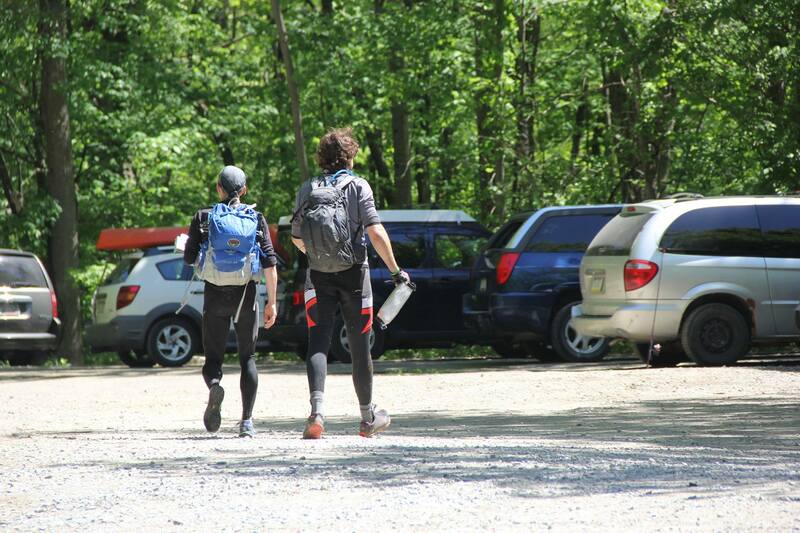 This time I’m writing about the May Raid Pulse race, an 8hr adventure race. Note I’m calling this an 8hr race, and not a 5-8hr race. Thierry, the race director, does an impressive job at ensuring most racers are out there for the full duration, so it does, in fact, end up being a solid 8 hour physical effort. 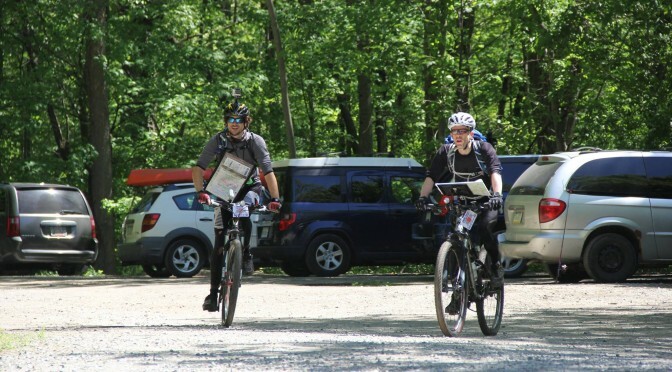 For this race, I teamed up with the formidable James Galipeau, a seasoned multi-day international adventure racer, so you know we were planning to go for the win! I was also covering the event for Get Out There Magazine, which meant I’d have cameras in tow. With that in mind, there are of course a nice little folder of pictures to check out in flickr, as well as the full video review at the end of this post. Now read on for the exciting tale! One of the best parts about racing with a team is that you can split the tasks in a race. 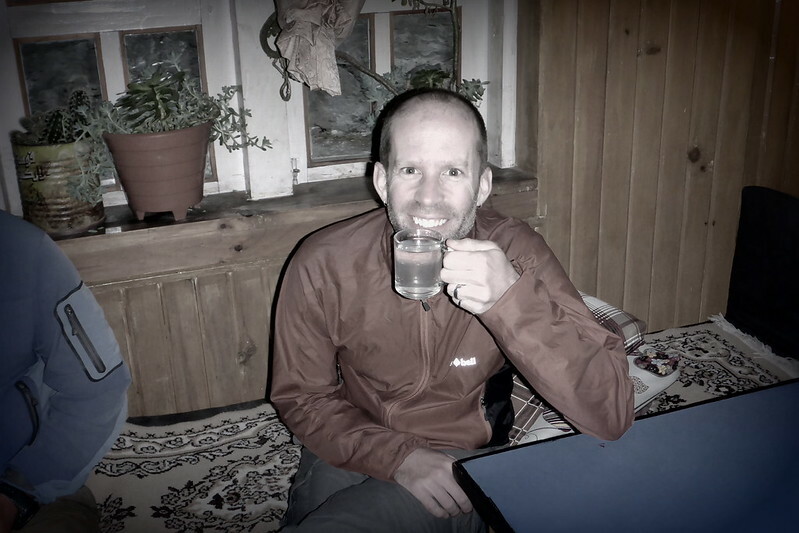 Most notable in this sort of race is that one person needs to be responsible for navigation, and the other can take care of things like checking for land features, punching the passport at the checkpoints, and in my case, doing some filming and narration as we go along. With that in mind, we decided that James would handle the navs for the race. He wanted the practice, and I was happy to oblige, as then I could blame him if we lost (or got lost). Ha ha. Kidding. To avoid a painfully early morning drive out to the race venue, we both opted to camp at race HQ, and partake in the morning breakfast buffet on offer. Seemed a good way to spend $16. It also allowed us to get registered the night before and ensure all our team gear was sorted and ready to go. What we hadn’t counted on was how cold it got that night! Not below zero, but close. 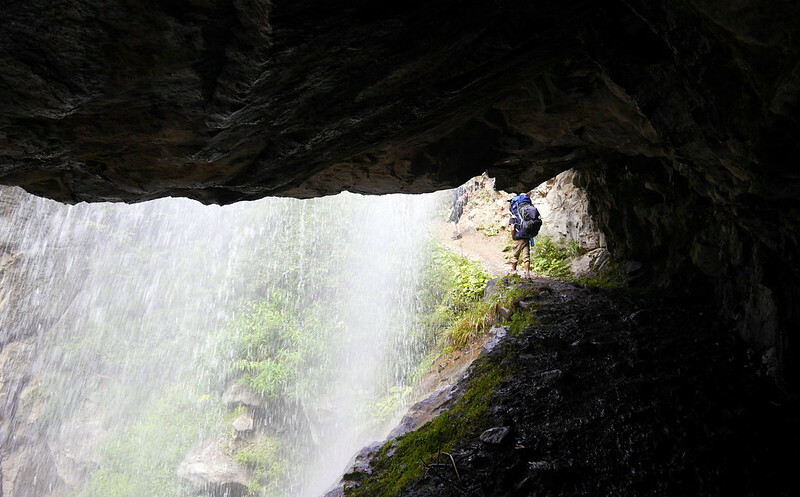 I was in my hammock, with no insulation underneath, so as the night wore on, I gradually moved from bag unzipped and in my underwear, to bag zipped, to bringing extra clothes into the bag with me, to putting on said clothes, to finally even wearing my jacket! Judging by the tossing and turning sounds from James little tent, I’d say he underwent a similar metamorphosis. With the rough night, I think I only managed 2-3 hours of fitful sleep, not ideal conditions for getting ready to race for 8 hours, but no time to dwell on that. We fueled up with a good breakfast, dropped off our bikes and gear at the transition zones, and headed to race briefing, where we got our race maps and instructions, and got busy planning our route. Lucky for us, the cold of the night disappeared quickly enough, and we had a sunny warm day for the race itself. No complaints on that front! Racers assembled at the start for final instructions before taking off on foot at 10am for the first section. 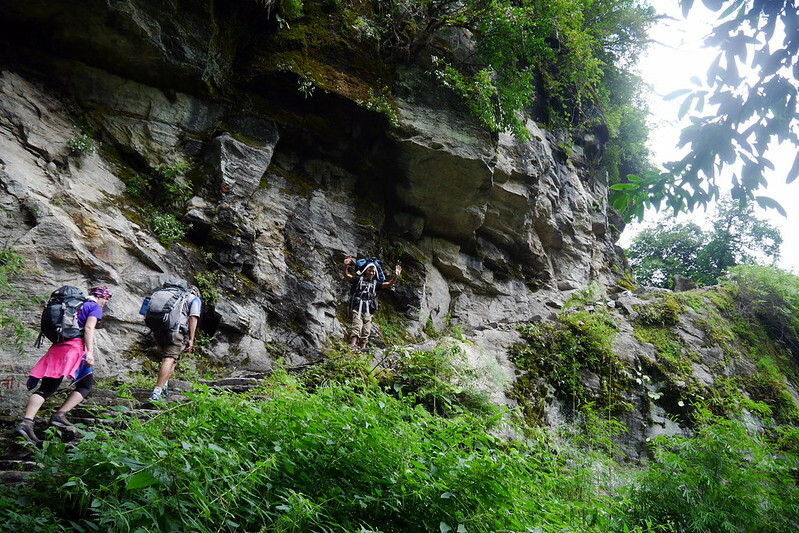 The initial section was all trekking / orienteering, and consisted of a pretty good mix of terrain to deal with. 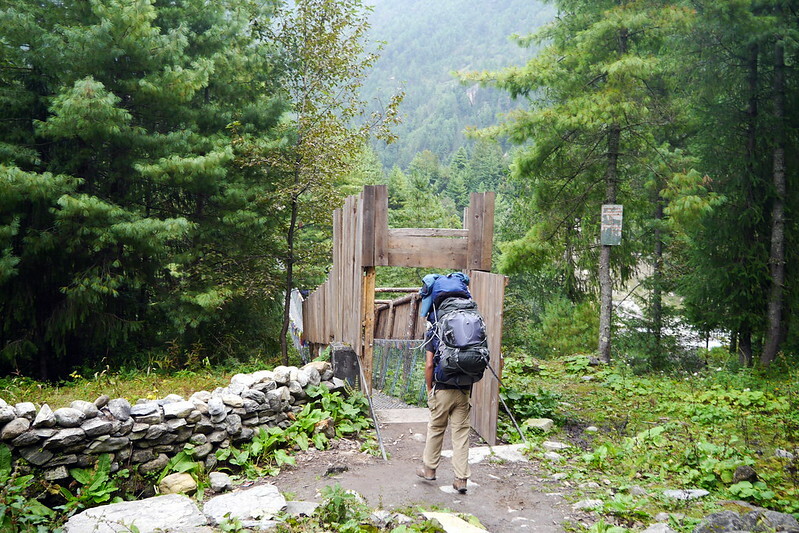 The very first checkpoint was located high up at the summit of a nearby hill. We overshot slightly on the trails before heading off-trail to find it. However, we were pleased to learn we were in 3rd place when we finally grabbed it. From that point, it should have been a relatively straightforward WNW bearing to get CP2. Unfortunately for us, a slight navigational error had us heading on a more WSW trajectory. 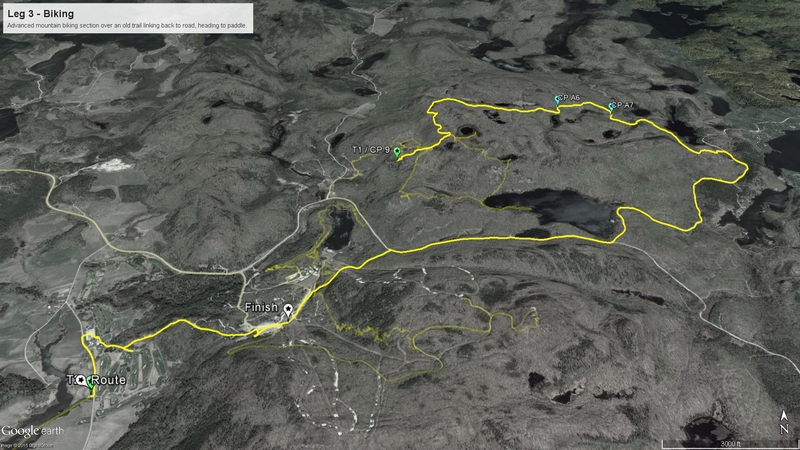 When you do that and traverse 1km of bush, it can add up to a pretty chunky time loss. In our case, hard to judge, but probably 30 minutes or so. This is NOT good in an 8hr race. 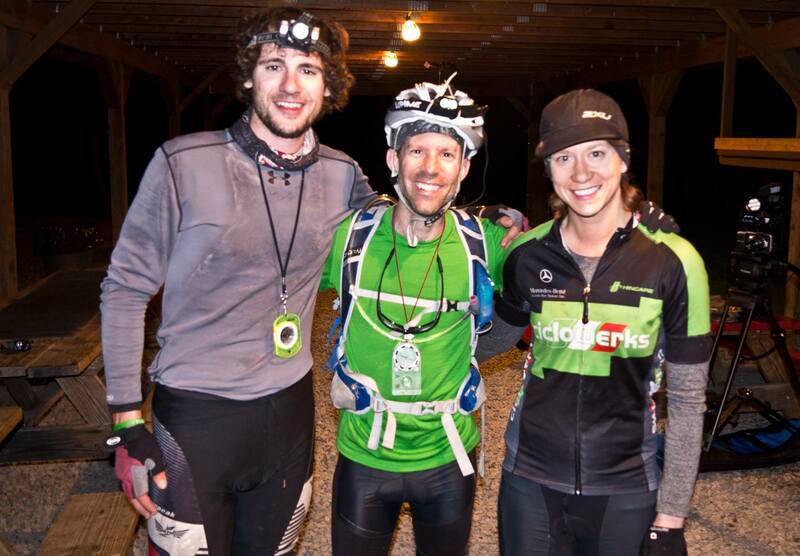 We found ourselves smack-dab in the back of the mid-pack racers. Ugh. Time to put the game face on and push hard. From that point, there were 2 more CPs to grab before the first transition. One of them involved a bit of a water crossing. Apparently, the previous evenings’ temperature left the air, but not the water. It was COLD. Especially when I stumbled on a submerged log and went almost completely under. Let’s just say there was shrinkage, and a desire to get out fast. Trouble is, this was semi-swampy, meaning very unsure footing. Regardless, we nabbed the CP and fought our way back onto solid ground. We made relatively quick work of CP4. We chose another ‘interesting’, if not inefficient routing to get from there to the transition, and as a result, still found ourselves in a position more than 30 minutes behind the 1st place team. With little time to dwell on our current position, I put one of our bike trail maps on my bike map board, we grabbed some quick energy food, and took off in hot pursuit of the phantoms ahead of us (as they were out of sight). Lucky for us, it was nice gravel roads under the tires, and we hammered hard on the opening sections to make it to the start of the fun mountain bike section that was located on the trails at Velo MSM. We managed to make up a few positions on this section, with high hopes to nail the rest of the race course. On arrival at the marshal point at the start of the bike leg, we were shown the location of the ‘advanced’ checkpoints on the trails. There were 2 to find, both pretty easy to grab on the trails. After copying the location onto our maps, we made our way onto the trails. What a treat! 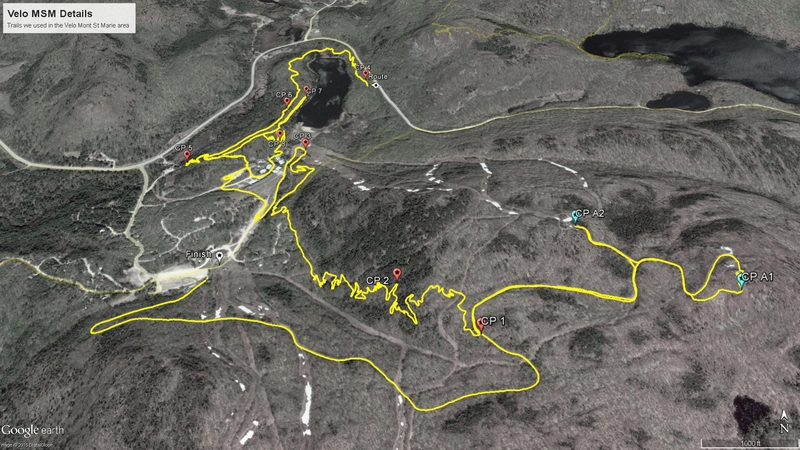 These are some amazing new trails that criss-cross the Mont St. Marie ski area. 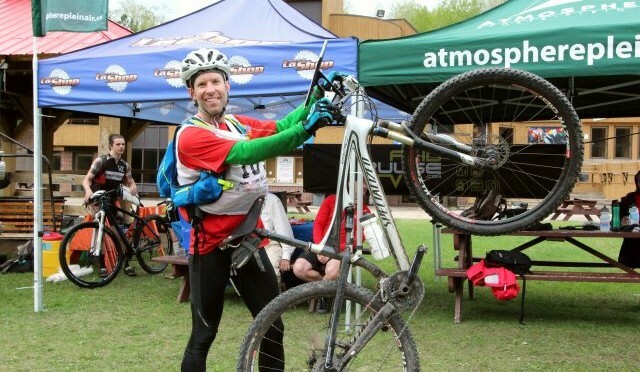 Well worth the drive up if you’re looking for a new mtb challenge close to Ottawa / Gatineau. Things in there went very smoothly EXCEPT for trying to find the stupid entrance to one of the trail sections we needed to get to. Lack of signs and confusing map illustrations complicated matters, and we lost a bit of time, although from what we gathered, we WERE NOT alone (and had a mini-train of riders with us at one point. 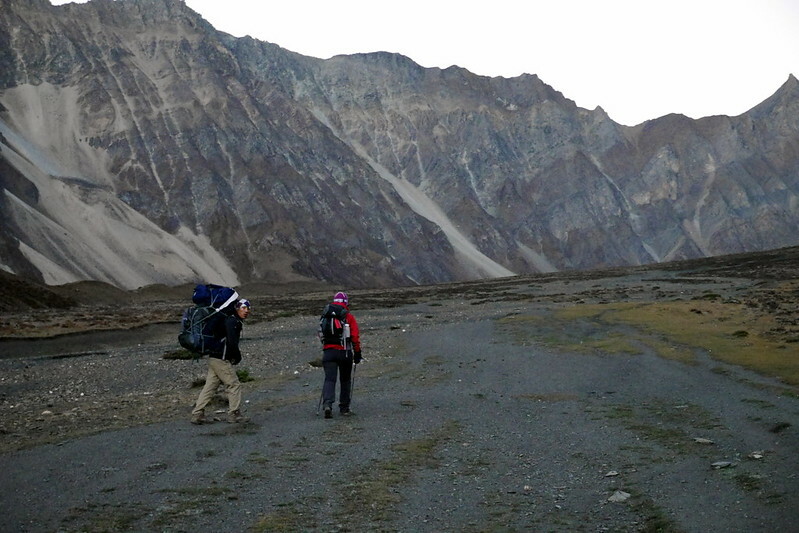 Once we found the right trails, things were pretty straightforward. 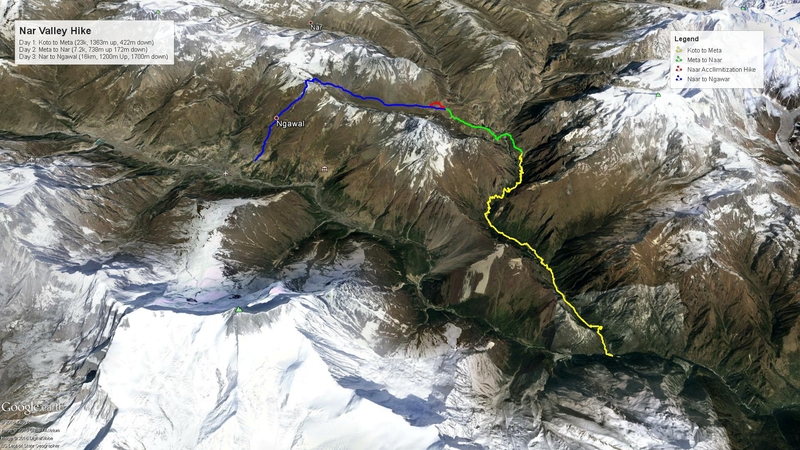 We made one big loop, ducking into the more technical trails to grab the advanced checkpoints. All CPs gathered in the Velo MSM trails, it was time to head back out onto the gravel roads and make our way to the next ATV trail section on the bikes, and ultimately get to the next transition. 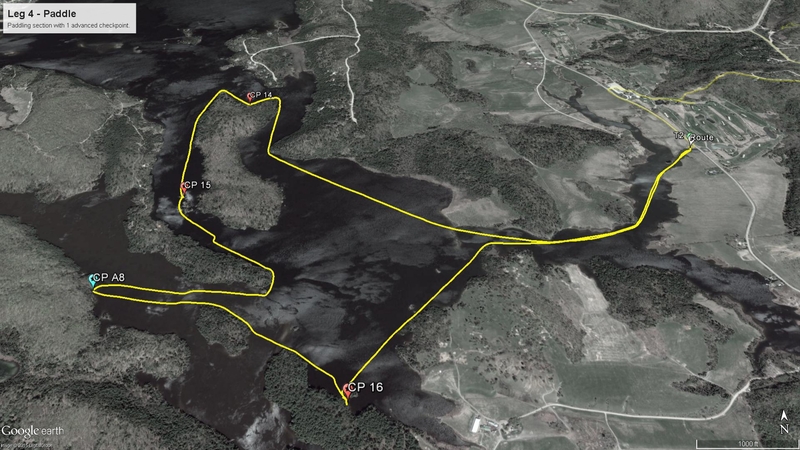 This particular part of the bike course got rather interesting. By that, I mean kinda tricky. Lots of tough riding with downed trees, and debris on the trails. There were quite a few overgrown sections and bike walking sections. For us, we held hope that it would improve our standing, as we kept pushing hard. At one CP, we were told we were sitting 11th overall. We passed one other team on this section, meaning we were at least sitting in 10th. Anecdotally, we’ve heard that other teams had pretty rough times out there, with one friend going through all their spare tubes and patches and being forced to basically walk out of the woods. VERY rough go for them. For our part, things weren’t great, but we kept moving forward. As you may recall, it had been 4 short days ago that I had a bad roll on my ankle, warranting x-rays. Although it hadn’t been broken, it was plenty tender, so I was wearing ankle braces. Due to the terrain, I found myself hitting the soft spots numerous times on rocks, trees, and even the bike frame. I had to really retreat to my pain cave to prevent from giving in to the misery of the moment. Luckily, good team-mates know when to talk it out and when to leave you be. James wisely let me suffer in silence, letting me dictate the pace and push as hard as I could. To close out the bike section, we dropped our bikes off at one clearing, then had to trek about 1km along the waters edge to get to the paddling transition. Along the shore, we also had to grab a couple more checkpoints, but they were pretty obvious and easy to grab. No chance of errors there. Arriving at the paddle transition, luck was with us. There was one ‘fast, lightweight’ canoe left in the fleet, so we grabbed that quick. We also pulled another quick(ish) transition and had more Boost and grabbed more food from our stash. 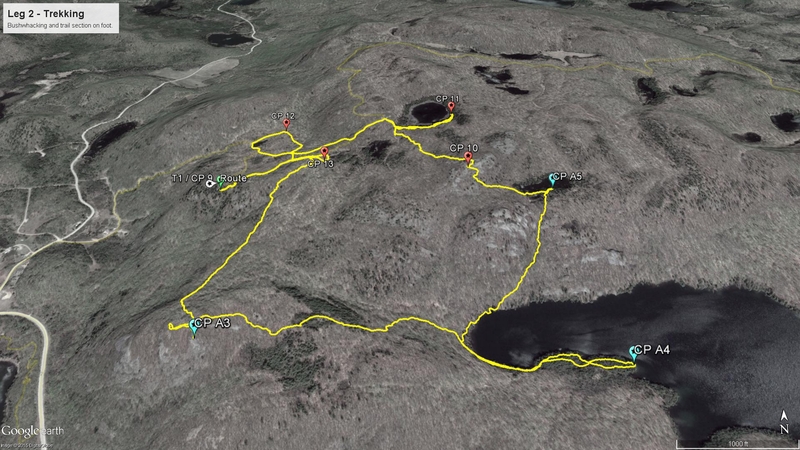 As well, we once again had to consult a supplementary map and sketch out 4 advanced checkpoints along the paddle section that we had to grab if we hoped to stay in the front pack of finishers. I took over navigation duties for this leg, as I was in the bow of the boat, which allowed James to handle steering duties while I’d check our course. Timing was going to be tight, but we headed out on perfect waters and with full intentions of grabbing all the checkpoints. They had to be picked up more or less in order so the route was pretty much pre-determined. That is, up until the advanced CPs, which we could complete in any order. 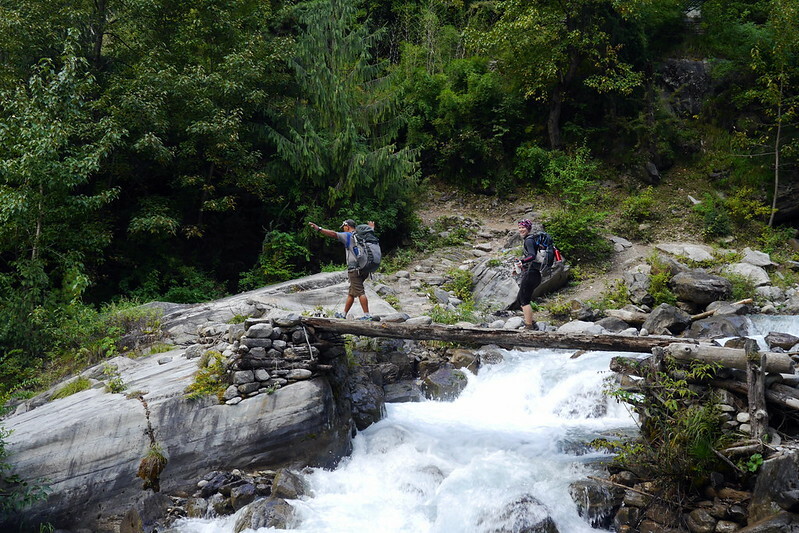 Here, there were a few options how to grab them, each involving different amounts of trekking or paddling, as they were located inland from different features. I made decisions on the fly as to how we’d attack them, and for the most part, things went pretty smoothly. Of course, things always look easier on a map than on foot, and I’m pretty sure one of the CPs was located a little further inland than intended. We still got it easily, it just meant more bushwhacking. Time was of the essence, and we could now see that finishing in under 8 hours would be a pretty tough challenge. We calculated our average boat speed, and looked at the distance of the last inland checkpoint. We had to make the tough call of how hard to push before making the decision to turn back to get to the boat in order to make the time. In essence, each CP was worth 25 points. Those with all regular CPs AND advanced CPs are ranked ahead of others. HOWEVER, for each minute past 8hrs, you were deducted 1 point. We had to time it that IF we were late, we needed all CPs, and be there before 8hrs. 24mins. Happily, luck was on our side. The adrenaline of the final push helped us grab the final CP in very good time, and piling back into the canoe, we figured we had exactly enough time to make it by 8hrs. There may have been no prizing, honour, or glory in our final ranking, which was 5th in our category and 9th overall, but we still had a bang-up race. 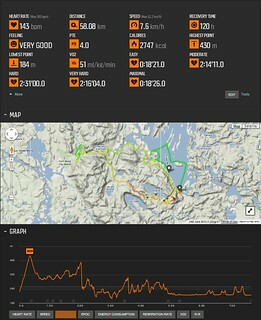 As is typical in AR, a couple little mistakes ended up costing us the podium. However, we still finished strongly, had a great race, and overcame physical and mental challenges to get there! I’ll take the rush of the event over the victory in most cases, since the podium is so elusive to us mortals anyway! Luckily, my next story MAY have a happier ending, but you’ll have to wait to read about that one. As usual, the post-race feast and atmosphere was great, and we enjoyed catching up with all the other teams to hear about their days. Per usual, our story was neither unique nor that impressive compared to what some teams had to go through for their ‘victories’. That is probably the best part of this whole community. We can all relate to the successes and the failures of the sport and our own abilities. It is a humbling pursuit to take on these challenges. But as always, Thierry and the whole Raid Pulse delivered a great experience in spades. If you haven’t done so yet, I invite you to watch the race video below to see some of the highlights. Until next time, play hard, and I hope to see you all out there!